When compiling Demon Lord’s Companion, I relied mainly on concepts and mechanics left over from the Shadow of the Demon Lord original design. When I ended up with an overabundance of content, it became difficult to decide what would stay in Shadow and what would be held back for future supplements. 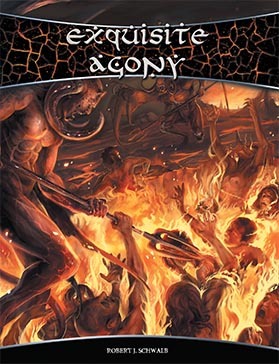 A great deal of that material went into DLC, while other pieces wound up in Poisoned Pages supplements and sourcebooks such as Exquisite Agony, A Glorious Death, and Terrible Beauty. Now, a bit over two years and over one hundred products later, my folders containing notes and bits left over from previous designs have grown empty. Rather than despair at such a situation, I took the opportunity to push the game in new directions. I looked for gaps in what we’ve released so far, scoured my shelves for inspiration, and hatched all kinds of oddities while holing up in my favorite bar to come up with an exciting selection of options for players. One of the best ways to expand the game is through ancestries, since these options can mesh with just about everything else. Therefore, this book gives you six, each a hidden people who have largely steered clear of the major events unfolding in the world. Their scarcity and unusual nature make them quite exotic, and playing these ancestries can reward you with awesome options while challenging your roleplaying abilities. Supporting the ancestries is a group theme mechanic to reflect the circumstances that hold a group of player characters together and rules to differentiate each group from the others. As you might expect, this book also provides a selection of paths to cover some underused areas of character creation and development, while also supporting the new spells at the end of this book—all associated with the new traditions of Invocation, Metal, Order, and Soul. So, from invokers to sleuths, fencers to auspexes, your characters have an awesome set of new options to explore. 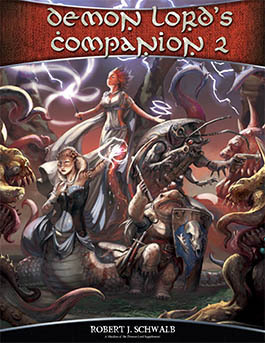 Demon Lord’s Companion 2 aims to help you tell stories by highlighting peoples of all kinds who find themselves engaged in the struggle to save the world from annihilation. 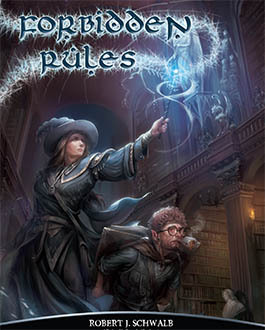 With this book, you can create unique characters, pursue mastery of new and esoteric forms of magic, or hone your talents in new and awesome ways. This book ensures that you never run out of interesting choices to make as you battle the darkness of the Void. 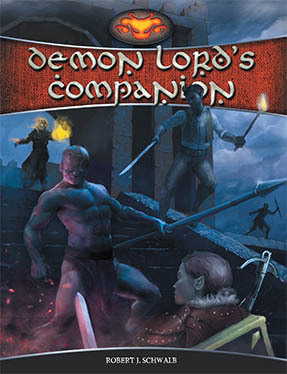 Buy Demon Lord’s Companion 2 in PDF here or on DriveThruRPG! Available in print, too! Approximately six hundred miles east of the Confederacy of Nine Cities lies a cluster of islands known as the Pirate Isles or, by locals, the Serpent’s Teeth. On the largest island, A’Val, stands Freeport, the City of Adventure. Founded by pirates long ago, the city has evolved beyond its criminal origins and has become a legitimate port city on the edge of the known world. Nevertheless, Freeport has had trouble shedding its reputation as a lawless, riotous place that is home to pirates, scoundrels, mad thinkers, and exiles. To be sure, such people live in the city, but Freeport is home to honest people as well—explorers, farmers, laborers, and others struggling to carve out lives for themselves far from the mainland. 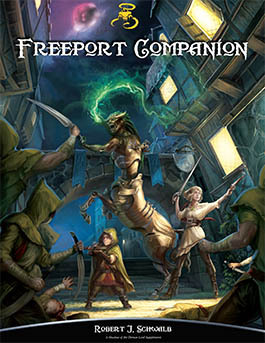 The city of Freeport, created by Chris Pramas and richly detailed in a variety of sourcebooks, notably The Pirate’s Guide to Freeport, has appeared in numerous worlds and been interpreted in a variety of game systems. The city’s lasting appeal comes from its blend of high fantasy, pirates, and cosmic horror, a perfect mix for a variety of games. Now, with the Shadow of the Demon Lord Freeport Companion, you can bring the City of Adventure to Urth and use the city as a setting for new adventures or as a haven for characters who dare to sail beyond the map’s edge. 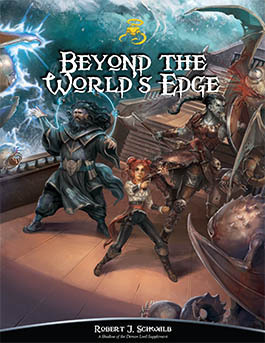 Although this supplement includes some information about the city, it is meant to be used with The Pirate’s Guide, which you can grab from www.greenronin.com, and any of the other fine sourcebooks that have revealed the city, such as Freeport: The City of Adventure for the Pathfinder roleplaying game. In addition, Green Ronin Publishing offers a variety of adventures and supplements for the setting, such as the Freeport Trilogy and Cults of Freeport. It’s no accident that the Pirate Isles made an appearance in Shadow of the Demon Lord. Freeport has always had a place in my heart, especially so after I joined the team at Green Ronin Publishing as a developer. Part of my job was to manage the Freeport line, and I had the distinct pleasure of helping to write The Pirate’s Guide. What grabbed me most about Freeport was the inclusion of Robert Chambers’s short story “The Yellow Sign,” a nice alternative to the Lovecraftian mythos that has long dominated the tabletop RPG scene. Add to that pirates, orcs, and weirdness, and Freeport was right up my alley. When it came time to build the world for my game, I had to leave a spot for one of my favorite fantasy cities. Freeport does have a setting of its own, but it was always intended to be put into any fantasy world you like, whether you’re using a published one or one of your own creation. In this way, Freeport slots right into the setting described in Shadow of the Demon Lord, and much of the lore and setting details can fit in with the conflict and trouble besetting the Empire. Then again, you could leave behind Urth and embrace the full weirdness of Freeport, using the setting as described in The Pirate’s Guide in conjunction with Shadow of the Demon Lord’s rules with no trouble at all. 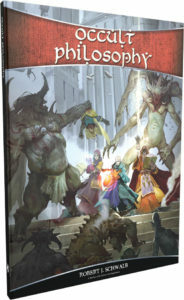 That said, this supplement aims at bringing Freeport into the world of the Demon Lord, and showing you how to adapt the city to fit into the story of the game. Freeport is home to elves and gnomes, humans and orcs, all living alongside each other in the chaos that passes for day-to-day life in the City of Adventure, and this certainly holds true for the Demon Lord interpretation of the city. You’ll find mad cults, cruel pirates, criminal organizations, a Wizards’ Guild, and more in these pages. All these elements and others work within the framework of Shadow’s setting, and where the two worlds don’t quite mesh, this book offers guidance to help bind them together. The setting differences between Freeport as presented in the past and the story in Shadow are sometimes considerable, but the settings overlap in plenty of places, too. Freeport stands on the ruins of an ancient civilization sworn to the alien god, Yig, and in those ruins their debased and degenerate descendants still live. Strange cults gather in the shadows of the city, offering deranged prayers to the Unspeakable One, a menacing figure similar to the Demon Lord in many respects, and lose their sanity struggling to puzzle out the power of the Yellow Sign. Freeport under the Shadow of the Demon Lord becomes a place of mystery and horror, a city steeped in the darkness of corruption—and a perfect place in which you can launch a new campaign. For centuries, jotun raiders sailed up and down the Empire’s coastlines in their longships, sacking towns and villages as far away as the eastern shores of the Northern Reach. Each raid carried off gold and plunder, slaves and magic to fill the vaults of the jarls, while turning the lands they struck into blackened ruins, the dead left for the crows. As history records, the Empire assembled a great and terrible host to lay waste to the lands of the giants and rid the world of its threat. The imperial hordes spilled south into the frozen wastes, shattered the jotun’s defenses, scattered their enemies, and took prisoners back in chains to serve as the Empire’s slaves. The conflict cost the jotun dearly. Nearly three-quarters of their population died in the fighting or were dragged off to be warped into orcs. Although starvation, exposure, and disease further winnowed their numbers, the survivors vowed vengeance. They endured during the first terrible years following the devastation and eventually rebuilt their holdfasts and longhouses, crafted new ships, forged weapons and armor, and increased their numbers over the following generations in preparation for renewing their war against humankind. 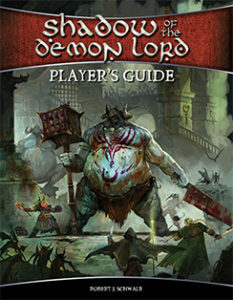 Like other supplements for Shadow of the Demon Lord, A Glorious Death zooms in on one region of the continent and lays bare its secrets. This book explores a stretch of cold, inhospitable land known as the frozen wastes. Like the Desolation, many in the Empire deem it uninhabitable by all but the hardiest people, and thus the most powerful nation on Rûl has made little effort to tame any of this territory. Other obstacles to civilization are the indigenous jotun, people with the blood of giants flowing through their veins; strange monsters birthed in the cloying darkness under the mountains; and the sense that dark, strange gods watch over all that happens here. Everything described in this book is optional and might not be appropriate for all campaigns. If you’re a player, discuss using this material with your Game Master. If you’re a GM, you can drop the setting information into any world you use, adapting the content to suit your needs. 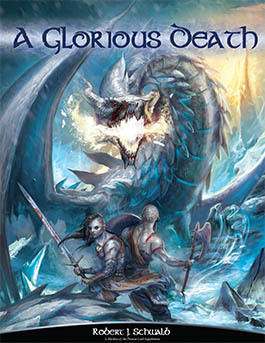 Pick up A Glorious Death from Schwalb Entertainment in print or PDF or on DriveThruRPG! Also, check out spell cards for A Glorious Death!